I have added a follow with FEEDLY button to my sidebar, incase you are waiting to the last minute to decide on your blog feed reader. I have been using both Feedly and Bloglovin for the last few months. I use Feedly most, because it works well on both my PC and my IPAD. So goodbye Google reader, hello Feedly. On to my post.Its a bit wordy...hard to tell a short story. Hubs and I have interesting road trips, in the sense that rarely do things go as planned. Last fall we went to Lancaster County in PA for a few days, hubs drove and I navigated. I love my techy toys and had just upgraded my Iphone. Well the maps were not exactly relliable after that upgrade...something hubs and I found out first hand on unfamiliar roads. When we got home and heard the news that there was a problem with Apple's maps app...we laughed, that explained a lot. So glad we also keep a road atlas in the vehicle. We drive to Great Mills, and of course there is NO MILL in sight, its a tiny tiny town. So we look about a bit, and hubs decided we will just turn around and go find some lunch. As he is driving to find a suitable turning spot, I vaguely see through the trees a big wooden building and can make out just barely ILL...Excitedly I tell hubs we have to go investigate. Around the next bend is an old mill, in Cecil Mills. It has a road, a small 2 store strip on one side and the mill across the road on the other side. We check out the store first, lots of art, antiques, and do dads. We found an art piece we both loved for the house, but decided to check out the mill before committing to a purchase. We enter together, and hubs turns left, me to the right...about 10 steps later I am in the PAPER CRAFTING section. YAHOOOO, Success... I picked up some stamps, some glue, some paper, and a few embellishments. Prices were great, too bad most of my craft budget was already spent for the month. So, now that you have patiently slogged through my story, here are two cards I made using one of the stamps I picked up. It is Cling Carnation CRP186. I made this for my monthly card exchange with a card making friend in California. I colored it with Spectrum Noir markers, added the bow from Jolee's and some MS Pearls. 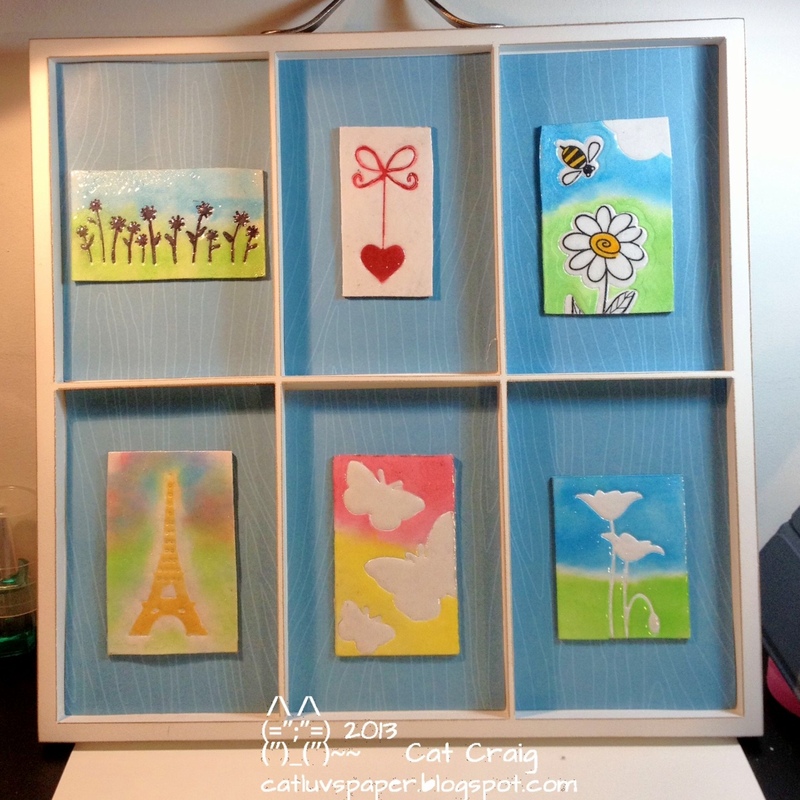 I matted with papers from Jennifer Ellory, and Bazzill Dotted Swiss, all mounted on a kraft card base. 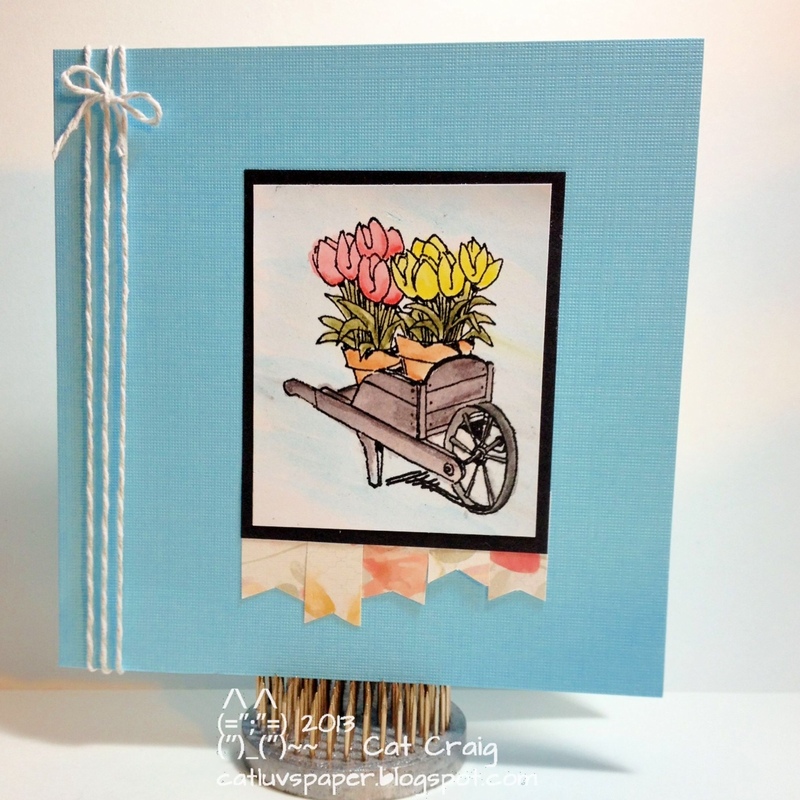 This card was made for Deborah's Card Chain Challenge for the Month of June. I went with the colors, a first time for me. The colors were Lavender Rose, Malibu Blue, and Frosted Mint. 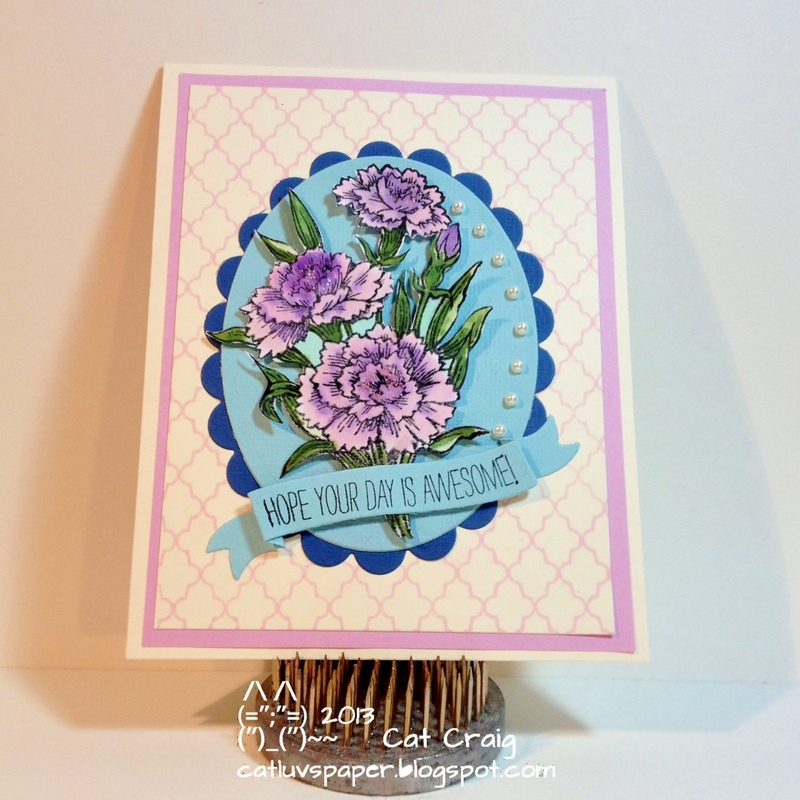 The carnations were colored again with Spectrum Noir markers, centers highlighted with a bit of cotton candy stickles, then fussy cut for mounting, pearls by MS, oval dies by Spellbinders, banner and sentiment by Simon Says Stamp, background lattice stamp by Hero Arts. Papers by Recollections. This card is being sent to Alaska. Thanks so much for taking a look. Have a wonderful day. Hello, thanks for stopping by. A former colleague and friend of mine is having a birthday. Her favorite color is purple, so I made her a few cards to have on hand and a birthday card, all featuring PURPLE. I have been wanting this Avery Elle stamp set for what seems like a long time, I finally ordered it and now it's getting kinked up. I used HA Neon Purple Ink, and HA Passion Flower Shadow Ink to stamp the front and the round sentiment window. 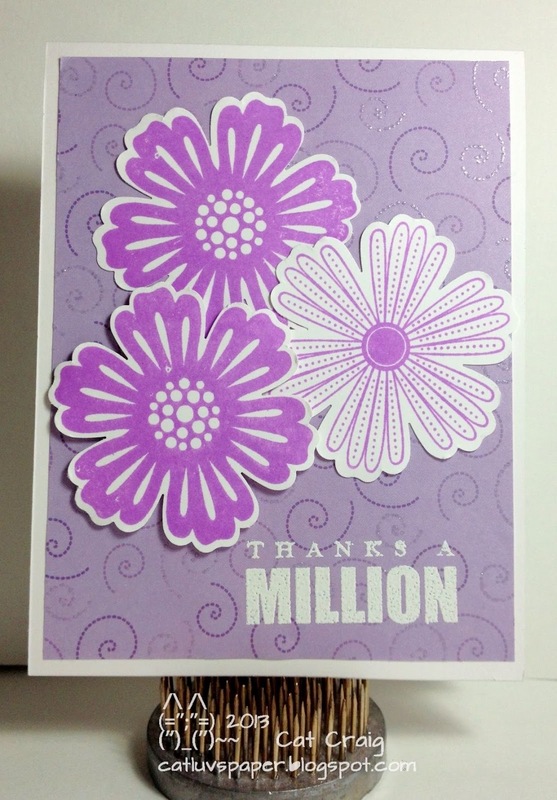 I used Very Vanilla cardstock from Stampin' Up, and some lavender from Recollections. The ribbon is from Ellen Hutson, and the pearls by MS. 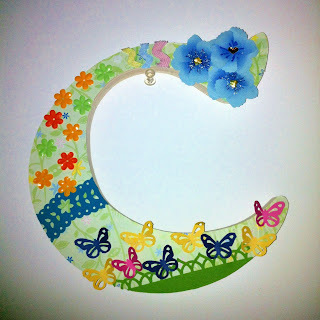 The embossing folder is from Sizzix- Circles and Dots set. The card set has 4 cards, all the same design with 2 sentiments. The sentiment stamps and banner die are from Simon Says Stamp (Tilted Banners, Tilted Banner Sayings), the image stamp is from Stampin' Up, the Embossing folder is from the Lifestyle Crafts Whimsy set. 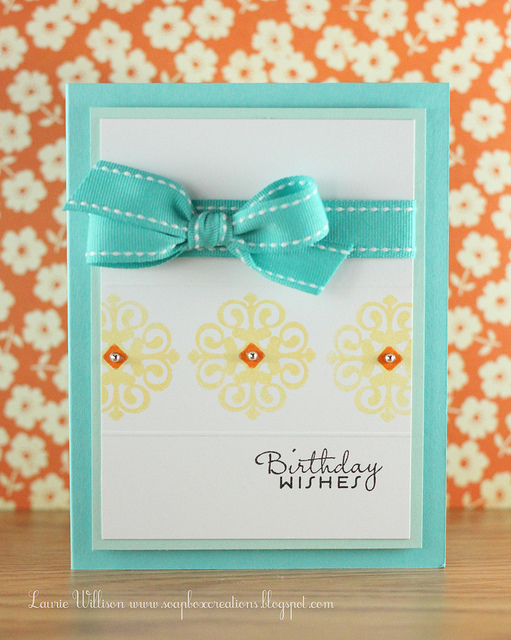 The ribbon from Ellen Hutson, and the window opening was cut with a Spellbinders Die, the circle with a Sizzix die. Happy Friday, thanks for visiting. 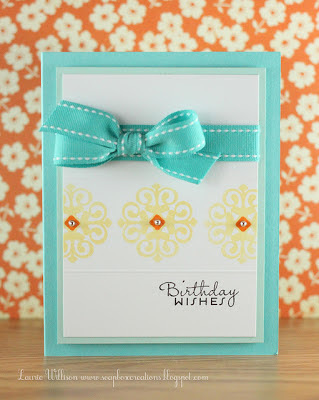 My California card making friend is having a birthday today. We exchange cards each month, and hers are STUNNING. 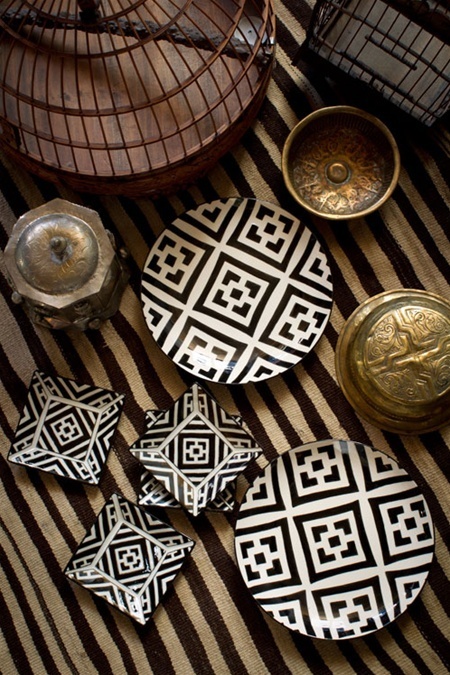 They are detailed and perfect, wonderfully embellished and just a joy to look at. So I stepped way out of my comfort zone to make her birthday card. I used pearls, I have a lot of them, but I never know where to put them, they always seem to look out of place. This time I used the die cut as a guide and the stamp as well. 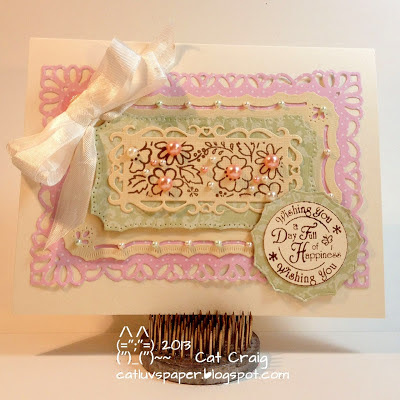 I used intricate spellbinder dies, ribbon, pearls, and a new stamp from DeNami designs ( I recently won a prize during their blog hop!) I decided not to color the stamp but just embellish it with pearls because so much was going on already. The papers are from Lilly Bimble, Stampin Up, and Recollections.The bow is snug hug seam binding. 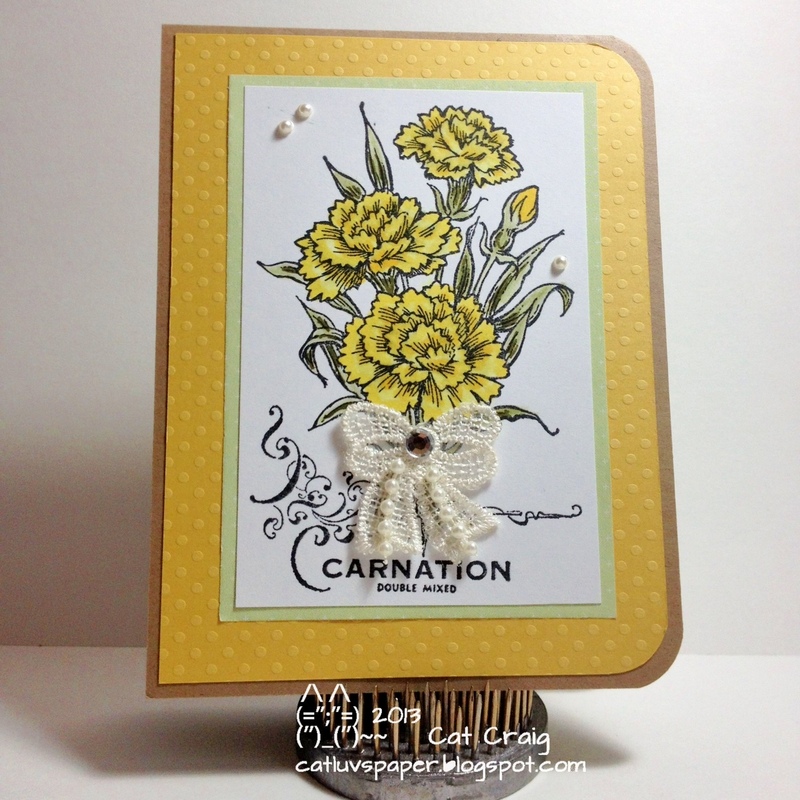 The sentiment stamp is from Lily of the Valley. I used Versa Fine ink in Vintage Sepia. I am not much good at waiting once I decide something. Down it came and I tore everything off of the letter down to the paper layer, I scraped off glue dots, and got it as flat as I could make it. 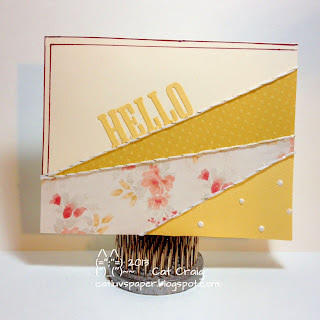 I used some yellow paper from Stampin Up and recovered that C. I trimmed the edges, filed them down with an emery-board, and inked the edges with Antique Linnen distress ink. Now I had a blank slate. I got out my Hero Arts Typewritten Letters, and began to place letters along the edge. 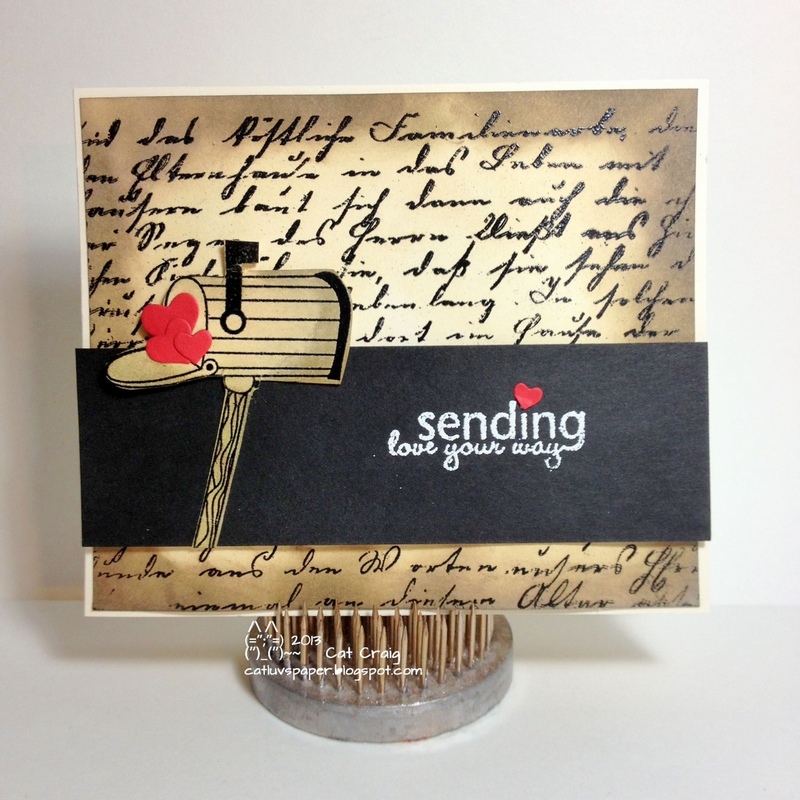 I placed them until I had no more letters, then stamped them with Versafine Vintage Sepia. I cleaned the letters and continued with my placement and stamping until it was done. The periods were tricky, I had to use an exclamation point, and make sure the dash got no ink. I added some recollection flowers, because I love flowers, and put pearls in the center to finish them off. And here you have it my new "C". Much improved I think, though hubs misses the greens and blues. Hi, I am so excited about this project. It's not a card. Back in January I started out with big plans to change out my six slot photo tray each month, and I kept it up for about 3 months...you can see the posts here and here. But sadly my tray has been neglected since April, I took the March items out and simply had no idea where to go next, so empty it sat. 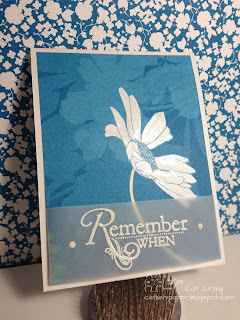 Today, rather yesterday (it's about 2:30 am EDT on Sunday) I watched Julie E's video over on YouTube on Die Cut Impression Embossing. She made the CUTEST tile. I LOVED it. You can watch the video at YouTube, just type in Die-cut impression embossing. It is so easy to follow, I encourage you to watch it. 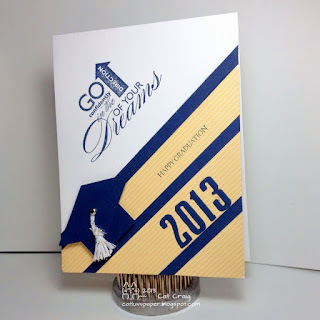 It involves some masking, making an impression with your die, some inking, and lots of heat embossing. 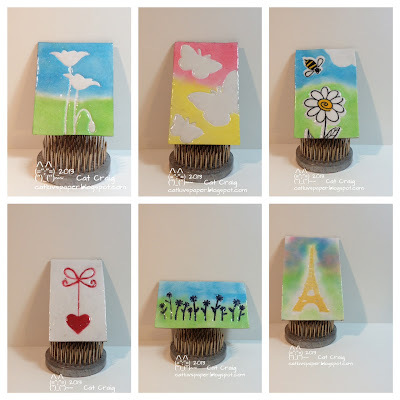 First pictures of the individual tiles, then a shot of them in their new home...I found some blue wood grained paper (on the B side of a sheet I had purchased for the floral pattern) for a background. Sounds odd I know, but it looks perfect to me. Thanks for indulging me, have a wonderful day. Hi when I first saw this Tuesday Trigger over at the Moxie Fab World, it reminded me of some old brass hanging lamps my mother had gotten in Morocco. They were brass with lots of tiny cutouts, as a child I really disliked those lamps. I came upon those lamps again this summer as I was helping my Dad go through the garage. We both traded stories about them, me cleaning him fighting to hang them up after each house move, we were a military family. I thought about it for a while and looked at the picture again tonight. My biggest difficulty was thinking of the appropriate sentiment. Tell me what you think. I absolutely want to crawl into the bed pictured in last weeks Moxie Fab World's Tuesday Trigger, pillows, florals, yellows...right up my alley. I had to play along. I didn't really feel that any of my stamps would do justice to the bedspread, so I found some patterned paper with soft flowers, some yellow on yellow dotted paper, some enamel accents and die cut a few letters...did you notice the "A" on the side table? I love the yellows, the textures, and the headboard with the trim accent. Those were my inspirations for my card. 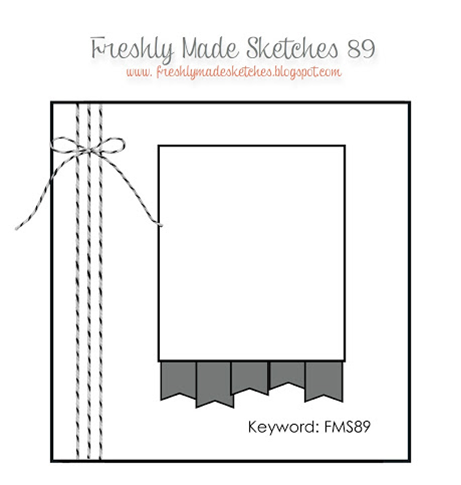 I am trying to broaden my challenge participation, and I really liked this sketch from Freshly Made Sketches. 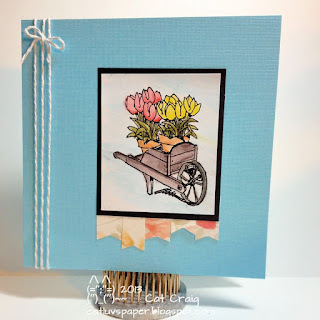 I used a 5.5 inch by 5.5 inch card base, grey and white twine, a cute never-been-inked stamp by by Art Impressions from my stash, a bit of patterned paper from MME In Bloom paper pad its kinda water color-ish, and my Derwent Inktense Pencils. A perfect rainy Friday, soup on in the crock pot, and my craft desk ready to go.I love the Mojo Monday sketch challenges, and I always think I'll get it done, but the week seems to fly by. Today, that was the first card I made. I used Elizabeth craft stickers, be creative tape, glitter ritz warm glitter, spectrum noir markers, MME patterned paper, another patterned paper scrap of unknown origin, and decided it needed no sentiment - I'll be using it as a note card. 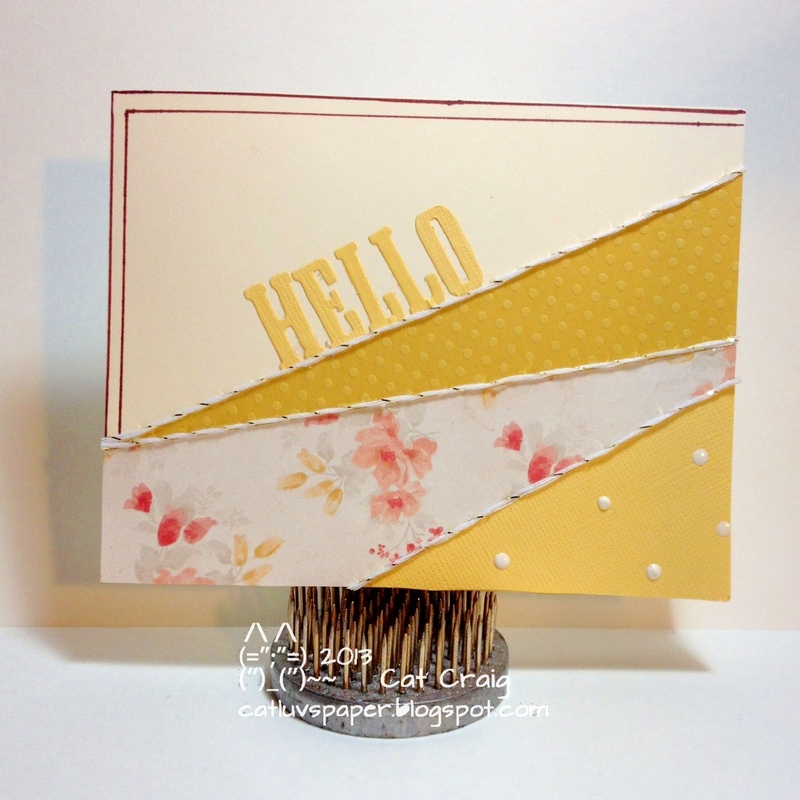 My second card was made for #104 Shopping Our Stash challenge - No Patterned Paper. Unity Stamp set and some die cut hearts using a Simon Says Stamp heart die. of the card. It is for hubs! Above is this weeks Muse Card, I liked the blue and yellow colors, the stitched ribbon, the score line above the sentiment and the triple focal images. I used a similar color combination. There are score lines on either side of my ribbon. 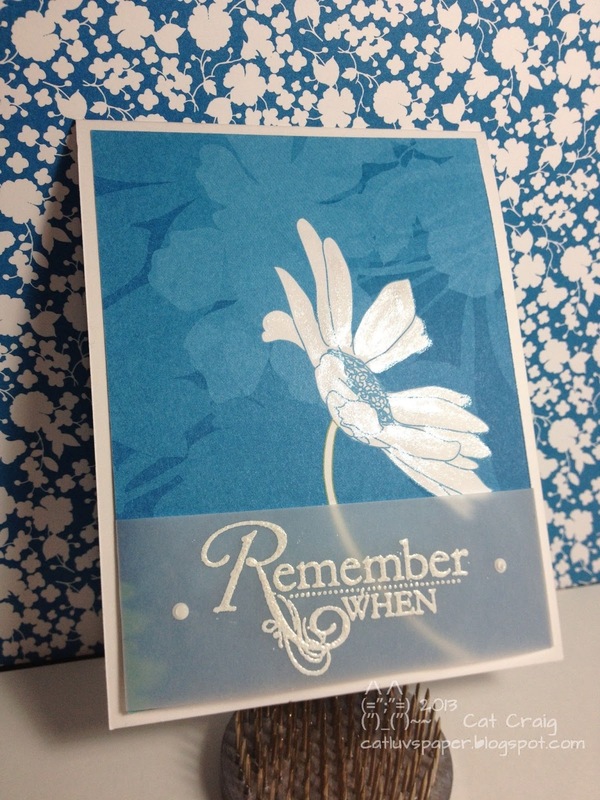 I used three focal points across the card front, all white heat embossed on blue cardstock. 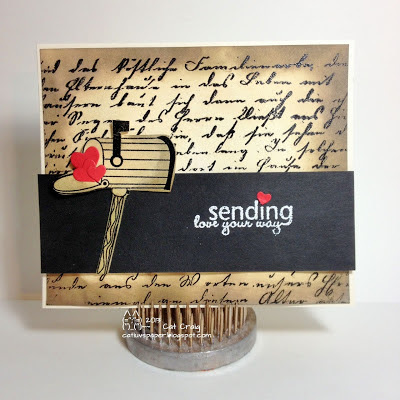 Sentiments are from Simon Says Stamp and Paper Smooches. The die for the front panel is also from Simon Says Stamp. 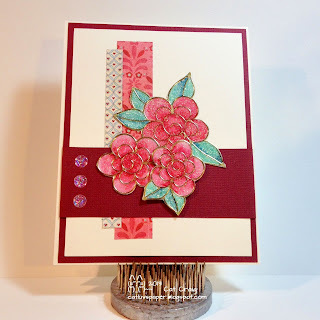 I used a Provo Craft embossing folder to add a bit of texture at the cards top. Thanks so much for visiting. Have a great weekend. 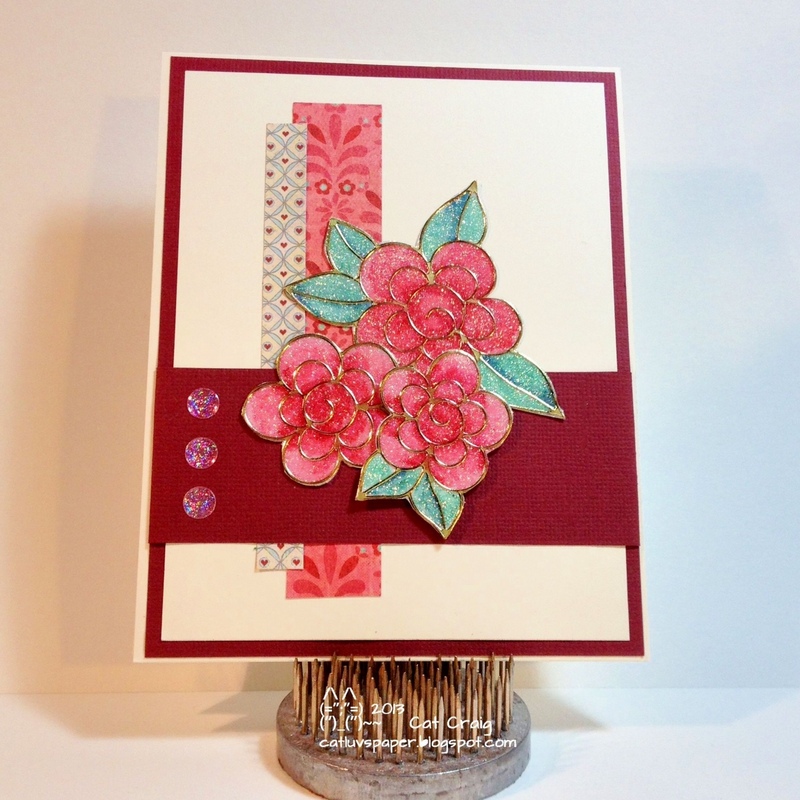 This card was made from a scrap of left over paper from the Paisley Petals collection. I just fell in love with that white flower. I added some Smooch Glitz to the petals, an embossed sentiment from Word Play on vellum and sent this to my longtime friend, reminiscing about times past. Hubs and I just celebrated our 5th wedding anniversary. I made this card for him. Our wedding colors were black white and red...though this seems to be a bit of an orangy red...I loved the puffed up hearts, the paper is from the Sweet Shop Collection . The sentiment is from Word Play, the sequins from Ellen Hutson, and I used Versa Fine ink. We are attending a high school graduation today, and I had made the graduation card a few months ago, but I didn't fall in love with it. So I tried again, this one I fell in love with. I used the school colors, sentiment in Night of Navy, Cardstock also Navy, patterned paper is from Just Add Cake, and the sentiments from Word Play and Teeny Tiny wishes. 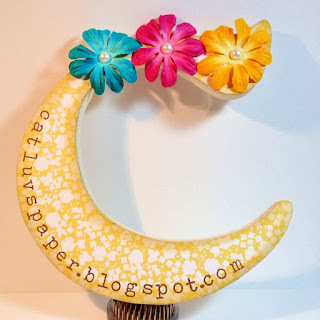 The numbers were die cut using Sizzix' Wanted Alphabet. The grad cap was cut by hand and eyeballed, the tassel is twine from Target's dollar spot and the brad from Making Memories. Red White & Blue, a photo by Cat Craig on Flickr. I made this for Kim's scramble at the Hero Arts Flickr group. 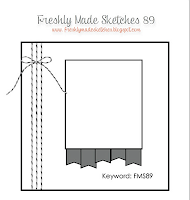 We were to use the colors of our flag, use at least one Hero Arts stamp or digi, complete photograph and upload our card to the scramble thread in 90 minutes. I am in the USA, so red white and blue were my colors. I stamped Old Letter writing in versamark, white embossed it, added red grosgrain ribbon across the front with a HUGE red bow. I finally opened up Tall Flowers, stamped them in HA Navy ink, colored in a few of the flowers with a red marker. Some flower centers were covered with blue sequin pieces, and other with white enamel accents. Two spellbinder dies, one to cut the flowers into an oval, and one for the scalloped edge. The center image was adhered with 1/4 inch foam dots. All was layered onto a Neenah aspen white 120lb card stock base. Thanks for looking.